Classes cost $90 every six weeks. 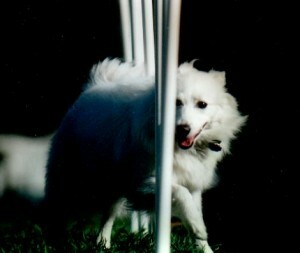 Classes at the field can range from rank beginners and puppy agility to Masters. Contact us to see what classes we are currently offering. City Dogs meets in a fully fenced field located on the southeast corner of NW 38th and Hammond. Our field boasts a concrete parking lot for adequate off street parking, many excellent shade trees, a soft grassy surface, and enough room for a full size field plus a practice field. -Go to NW 39th Expressway and MacArthur Boluevard. -Go south onto MacArthur Boulevard. -Continue south one block to NW 38th Street. -Turn right onto NW 38th Street. Go one block. -The City Dogs field will be on your left (south) side. Kristin Kaldahl began training dogs at 14 years old when she trained her first dog, a collie, to his CD (Companion Dog) title in obedience. Currently, Kristin and her Shelties – Asher, Aenon and Jericho, who is hard of hearing – compete in agility, obedience and Rally-O. 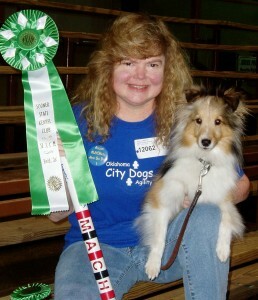 Over the years, Kristin has put over 170 competition titles and certifications on six dogs who have included Shelties, an American Eskimo and a Collie. -Series of training articles published in the agility magazine, “Clean Run” in 2009. -Six MACHs and two PACHs. (Aslan/Asher/Aenon) The first MACH in Oklahoma City! Aside from teaching agility, Kristin Kaldahl also writes about dog agility for PetHelpful and HubPages. You can find her articles ranging on topics from agility for the newbie to genetic research and training techniques at hubpages.com/@agilitymach. If you are looking for an agility school in the Tulsa area, check out DOGTAG at their website here. They are located in Mounds. There are several different organizations that offer agility competitions. The biggest is the American Kennel Club. You can read their agility information by going to their website. 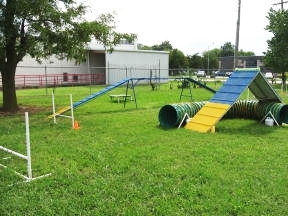 In Oklahoma, most agility trials are held under the AKC. The second largest agility organization is the United States Dog Agility Association. You can find their website here. Kristin also designs dog related items through Zazzle.com. Kristin designed the 2016 AKC Agility Nationals Team Oklahoma state team and supporter shirts. Her 2R1 and Journey collections can be found at her Zazzle store zazzle.com/activecanine. Be sure to get the latest promo code posted at the top of the page. Zazzle is always having great sales that will drastically lower the price of the item you want.